Breshna Musazai took three bullets and nearly died when terrorists attacked her university two years ago. Last month, she received her degree — an achievement that’s inspired multitudes. 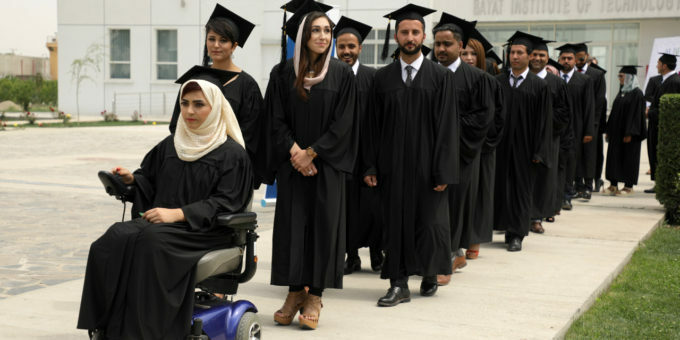 When 28-year-old Breshna Musazai walked on to the dais last month with the help of her mechanical walker to accept a college degree, she was already making strides into Afghanistan’s history. Her limp, the result of polio in her right leg that she contracted as a kid and injuries in the left leg that she suffered during an attack on her university, didn’t seem to slow her down. Musazai, a student of law, was among the many students who were caught in an attack on the American University of Afghanistan (AUAF) in Kabul on the evening of August 24, 2016. Thirteen students and staff members lost their lives when the war-torn country’s prestigious education center came under heavy attack from the Taliban. Several other students like Musazai were severely injured in the attack that lasted for more than seven hours. “Can I tell it in short? Because when I talk about it … ” Musazai’s voice trailed off, and she had a distant look on her face, as though she was someplace else, and not in the living room of the Kabul home that she shares with her parents and seven siblings. “I was in the campus mosque and had just finished my prayers. I was about to step out when my friend and I heard loud gunfires,” Musazai, recalling the horrifying events from nearly two years ago, told Women in the World. “My friend reacted first, she immediately shut the door. In that moment we heard a loud blast. I found myself on the floor of the mosque, it went dark,” she said, narrating the sequence of traumatic events that followed on that fateful day. Musazai was slowed down due to her polio leg, even as many other students who were with her ran to the nearest emergency exit. “I was left behind and as I tried to find my way out through the building close to the mosque, I had to walk barefoot on shattered glass and splinters,” she said. Her goal at that moment was to make it off the campus without being noticed by the gunmen unleashing the bloody siege. With all hell breaking loose around her, Musazai managed to reach her fiancé by phone and he advised her to find a place to hide rather than try to escape. Musazai also waved at the police, to draw their attention. “One of them asked me to drag myself towards them with my hands. I tried but I couldn’t. I kept looking back again and again because I was afraid the terrorist would return. My right leg wasn’t very strong and the left leg was in tremendous pain. I felt I was going pass out,” she said. “That’s when I heard the gunfire and felt the bullets fly over me,” she said, reliving the horrors. One of the gunmen had shot at the policemen trying to help her; she was caught lying face down in the exchange of fire between the police and the insurgent. The college student was shot again during the crossfire, taking another bullet in her left leg, and it wasn’t until an hour later that she was rescued after the police had killed all the gunmen in the building. Outside, barely conscious, she saw her father. “I said, ‘Look father what happened to my leg!’ and he replied, ‘Don’t worry, things happened for a good reason.’ I was very happy and relieved in that moment with my father,” she said, grateful to be alive. Musazai took a pause from telling her harrowing story and to break the fast she was observing for Ramadan, a monthlong Islamic practice observed by Muslims all over the world. “I fear for her when she leaves the house everyday, but I am always praying for her success,” her mother, did not wish to be identified by name for the story, said, bringing in the dates and rosewater as the family started their prayers, deep gratitude enclosed in each of them. “I am so grateful to God that he gave her a second life. She has struggled a lot and achieved so much despite the hurdles,” her mother said proudly. The horrific and brazen attack targeted at Afghanistan’s youth illustrated the Taliban’s misguided hate for development in the war-ravaged country. But those that survived the attack have persisted. Even though several students were unable to return when the university re-opened in March 2017, several others like Musazai came back more determined. Ghizaal Haress, the chair of AUAF’s Department of Law and Musazai’s professor, has been testament to her resilience. “I have watched Breshna quite closely even before the attack. She always worked hard and never let anything hold her back,” Haress shared, recalling how Musazai has been involved with all curricular and extracurricular activities, including representing the university at a moot court in Hong Kong. “I went to see her two days after the attack at the hospital, and I was so amazed to see that she had a smile on her face despite the pain she was in,” she added. Haress recalled how Musazai narrated the incident with a calm demeanor, much like how she recounted the story to Women in the World. “That was a sign of her courage,” Haress observed. The injuries to Musazai’s leg were very serious and required many surgeries, some performed in the U.S., before she was able to get in a wheelchair and move. The emotional scars ran even deeper. “I couldn’t sleep for nights together. Every time I closed my eyes, I could hear gunshots. I would feel someone walking towards me. Even now when I hear gunshots in Kabul (which is a common occurrence) I panic, and I have nightmares. I see the war in my dreams and it feels so real,” she shared, adding that she consulted with counselors to help deal with her trauma and insomnia while in the U.S. receiving treatment. However, not one to give up easily, a year after the attack, Breshna Musazai arrived back onAUAF campus in her wheelchair — something she’s still getting used to — to finish her last semester in the law program. “There was a brief period during my recovery when I thought I would not be able to go back to school. It seemed to me that my life was over,” she said, adding that she believed that the war had started again — the kind of fighting that forced her family to flee their homes and live, for decades, as refugees in the neighboring countries. “But then my professors who were in touch with me, they urged me to return. They even installed ramps for me around campus to make it more accessible,” she said. Haress witnessed Musazia’s resolve to come back to school. “It has not been easy for her; she was on a wheel chair but she always delivered all assignments and tasks that were set for her with a smile on her face,” she shared. “Her grades were even better after the attack — it says that she has not allowed the tragedy and terrorism affect her education,” the professor observed. Musazai’s family members, especially her father, were also strongly in favor of the idea of her return to classes. “My father has always encouraged my education, sometimes even over my brothers’, which is not something you see often in Afghanistan,” she said, adding that she was the only woman in her family to have achieved a college degree. “There was time after we returned from Pakistan and our finances weren’t plenty, but even then my father prioritized funding my education and asked my brother to wait. Her brother, too, carried her up and down their multi-story home for her to be able to travel to school. “He has now secured a scholarship to continue his education,” Musazai is proud to point out. Musazai’s first day back was harder than she imagined, but to her pleasant surprise she saw many familiar faces around campus, some she recognized from the day of the horrific attack. “It was difficult being the student on a wheelchair, but people were very encouraging and supportive. They said positive things to me and shared good comments about me. It gave me more courage,” she said, crediting those who’ve supported her for her eventual success, and motivation to study more. “I was scared, of course, but if I want to do something for my country I had to overcome those fears,” she explained. Musazai hopes to work in the field of human rights some day, maybe even join the war-torn nation’s political system. “If the country needs me, maybe I will,” she mused. When Musazai drove into the campus on her wheelchair earlier this month to accept her degree, one that she fought for with her life, she remained determined to be the symbol of resistance against everything the insurgents who attacked her believed in. Photos of her smiling on stage, albeit supported by her walker, and later with her batchmates in a wheelchair, went viral on the Afghan social media space. Musazai represented a new generation of Afghan youth who pursue education and knowledge, despite the growing threats in Afghanistan. Some even compared her to Malala Yousafzai, child activist from Pakistan who suffered a similar fate at the hands of the Taliban but came back as a stronger voice against extremism. Even as her story inspires many Afghans, the accolades she receives empowers Musazai in turn. “When I was a disabled child, I always thought that I was nothing. Now when I see people who say they are inspired by me, I feel so strong. I want them to know that their support makes me want to do more,” she said. “It also feels so good to see people using my story to support women’s education. I want them to keep supporting education,” she added.